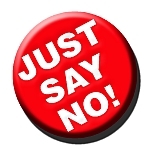 Years ago there was a n anti-drug campaign whose slogan was “just say no!” Kids who are offered drugs were encouraged to just say “no.” “No” is a word that we all understand. Even a dog understands the word “no.” It should not be surprising, then, that “no” is a word that the Lord often speaks to us as He is leading us in our daily life to express Him. The word “no” can make us feel uncomfortable and uneasy inside. In 2 Corinthians 2:12-14 the Apostle Paul was headed in a certain direction to preach the gospel when, all of a sudden, he had no rest in his spirit. In verse 14 he attributed that uneasy feeling in his spirit to God’s leading. Although there was nothing inherently wrong with Paul’s original plan to preach the gospel in Troas, that “no” from the Lord in his spirit changed everything. At that juncture the spreading of the Lord’s kingdom made a turn to another continent—Europe.